Beta phase: 2016-2018. Official updates and bug fixes to the Commore-AmigaOS 3.1 code (unfinished by Commodore due to their bankruptcy). Fast File System (FFS) with native 64-bit support for NSD, TD64 and direct SCSI, long filenames and resizable media support and... bug fixes. CrossDOS with native 64-bit support for NSD, TD64, and direct SCSI support; long filenames and resizable media support and a new mfm.device... with bug fixes. Format, DiskCopy and HDToolBox with 64-bit support based on NSD, TD64 and direct SCSI support and... bug fixes. C:Mount for large media, direct SCSI support and resizable removable media. Working soft links for the RAM disk and the Fast File System. ...which are more bug fixes. Math libraries that reconfigure themselves when an FPU becomes available after loading... did I mention bug fixes? A Dir command with nicely-formatted output and guess what: bug fixes. Shell with native support for pipes. New Workbench that also copies links... and more bug fixes. CPU command with 68060 support... and also bug fixes here. SetPatch, without NSDPatch and ROMUpdates (you won't need it anymore). Intuition with off-screen window dragging. Celebrate the retirement of the last piece of BCPL code in AmigaOS: The Aux-Handler is now completely in C. ...and has bugs fixed. And a few good friends could join the party: the V45 layers.library, the V45 Execute command, and a V46 Shell. The update will include a new version of "DiskDoctor" which "examine the contents of the volume, looking for defects and copying the contents of the directory tree to a different volume." Large volumes and long filenames are supported. The new version of DiskDoctor only requires 1MB dealing with a 1GB partition, and 8MB for an 8GB partition. A replacement for the CD filesystem CDFS: A backport of the CD file system of AmigaOS 4 (currently without supporting mixed-mode CDs, UDF, HFS and HFS-plus) which supports the new mount options "NoNSD", "DirectSCSI" and "SuperFloppy". Besides, "Mask", "Maxtransfer" and "BufMemType" are honoured. "CrossDOS now also supports long filenames, FAT32, FAT24 and FAT16." CrossDOS as well as the new CDFS now are multithreaded; that means they do not freeze Workbench any longer while working. 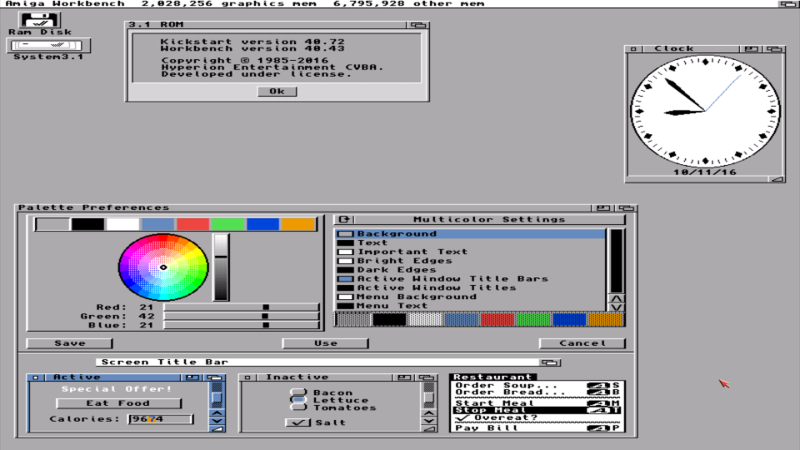 Obviously, Workbench as developed by Olaf Barthel from AmigaOS 3.5+ is used—or at least part of it: Thomas Richter mentioned that replacements for the prefs programs of Workbench and ASL have to be used since ReAction was removed. The programs MagTape and Edit were removed from the distribution. Edit "suffered from several bugs and limitations". workbench.library and icon.library "are already too large to fit into the ROMs", so they will be on disks. They will also take more RAM, "so that there is less left on the low-end machines. It will probably not work with 512K alone."